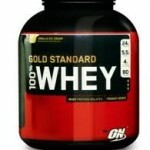 Click here to buy Optimum 100% Whey Protein at Bodybuilding.com. Whey Protein powders are a healthy and inexpensive supplement that can help you easily and inexpensively get enough protein for your body’s daily needs. Like many supplements, there is a best time to drink a whey protein shake. There are also times when another type of protein powder is a better choice. The optimal time for drinking whey protein shakes is before and after you workout. The reason for this is that whey is absorbed very quickly after you drink it, often within one hour. This rapid rate of digestion/absorption enables the protein and nutrients from whey to help your body ‘turn on’ its recovery processes. Over time this can lead to you having more muscle. Unfortunately, since its digested so quickly you may find yourself feeling hungry shortly after drinking a whey shake if that is all you eat or drink. Instead of drinking a whey shake only you can drink it as part of a meal with whole foods or instead use a whey-casein protein shake such as BSN Syntha-6. When choosing a whey protein we recommend you buy one that contains the highest quality whey proteins at a fair price. More specifically you should buy a product that uses a blend of whey isolates and concentrate. A really good product will also have a digestive enzyme like Aminogen added to help your body digest and utilize as much protein as possible. The product that we recommend is Optimum Nutrition 100% Whey Protein. You can learn about it by reading our in-depth review.